It is not a mirror. Only one blue Chevrolet ride allowed at WDW. Also, this is not a mirror image. It will have the canopy. It’s not a true Disney vacation unless there’s a giant crane in Tomorrowland! So futuristic! add some sequencing neon rope lights to it and you've got an upcharge event! 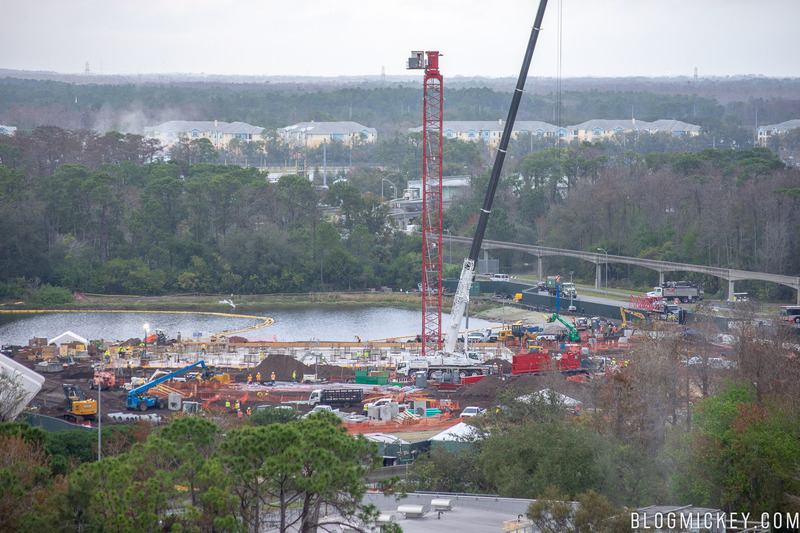 Tom Bricker is hoping the UoE dinosaurs would be moved there for a diorama comparable to DL. There's plenty of room on that berm for a UoE dinosaur diorama... if they press the dinosaurs in a giant book first. Here's an idea of the building at DL. Keep in mind it also contains the Grand Canyon along with dinosaurs. To recreate both dioramas at the MK, it would be very, very tight. The show building would have to be right on the edge of where the expanded retention pond be. There'd be room for just one of them, tho. Or, they could put the grand canyon diorama right after BTMR where it would fit thematically. Is there room for a giant LCD screen streaming Martin’s Universe of Energy tribute? Personally, I’ll pass. I’m a California local so I love the dioramas, but my favorite part of the Walt Disney World Railroad AND the approach to the Magic Kingdom is the vista on the railroad tracks, on that peaceful grassy embankment in between Tomorrowland and Seven Seas Lagoon. That is one MK-specific feature that gives me the warm fuzzies. Yes leave well enough alone. There needs to be something more in the back of the park with the train, though. Just seeing plenty of trees and shrubs kinda gets old when travelling from Frontierland to Fantasyland. The bigger problem is it is not just shrubs and trees...you can see roads and buildings back there too... The scenery along the railroad really needs to be stepped up... As soon as the train passes the station and heads into Adventureland there should be specific settings to clearly delineate each of the lands...Settings for Fronteirland ( they have a few things) and more for the area between Frontierland and Fantasyland...Flora Fauna and Merryweather's cottage could be tucked into the woods... Cinderella's Stepmother's house could be there...Pixie Hollow.... The swampy retention pond back there coulsd be dressed up as the swamps from Princess and the Frog...so many things could be done...then futuristic set pieces as it heads into tomorrowland... Make the train a real Must See circuit....and all that could be done without a massive show building, just architectural set pieces and some basic animatronics... and beautifully lit for night. This. If they were going to add a diorama (or 2...) to the RR, they should do it in the stretch between Frontierland and Fantasyland which is relatively long and kinda boring. A grand Canyon themed one fits well thematically, but they could go a number of ways with it. I would really like to see them spruce up the railroad and with the closure going on, it is a good opportunity for it.